Arctic cold will be relentless and punishing for much of the nation for several days to come and many areas will be experience some of the coldest weather in decades to begin a new year. In fact, the three week stretch from around December 20th to January 10th could be one of the coldest stretches we’ve had across much of the nation in a long, long time. A clipper system will drop southeastward and into the DC-to-Philly-to-NYC corridor on Saturday – likely with accumulating snow on the order of a dusting to an inch or two – and it will usher in the coldest Arctic air mass so far in this cold wave for the Sunday, Monday, and Tuesday time period. Indeed, average temperatures in the eastern two-thirds of the nation may be the coldest ever to start a new year in about 70 years of record keeping. New York City will ring in 2018 with temperatures near the 10 degree mark and wind chill values of below zero are quite likely. This would be one of the coldest New Year’s Eve celebrations in New York City during a century of record-keeping. It will be frigid in Philly on Monday for the annual Mummer’s Day parade and frigid air will be felt in DC as well with all of its New Year’s activities. One of the parameters that weather forecasters use in computer forecast models to help in the prediction of surface temperatures is known as the “1000-500 millibar thickness”. This “thickness” is a measure of mean temperature in a lower-level layer of the atmosphere and ranges from 4900 meters in cold wintertime atmospheres to 5900 meters in warm summertime atmospheres. It is not often that one sees a “498 thickness” in the Mid-Atlantic region during the wintertime, but that will be the case on Monday morning, New Year’s Day. In addition, it looks like another bitter cold air mass will arrive late next week according to the latest (12Z) GFS and thicknesses go right back down to those painful levels at the end of next week. Bottom line, don’t be surprised to see some readings near zero early Monday morning (and perhaps again late next week) in some suburban locations in the DC-to-Philly-to-NYC corridor. One of the amazing aspects of this cold wave in the I-95 corridor in recent days is that we are seeing single digits in many locations without any snow cover. The deep and widespread penetration of the Arctic cold has essentially prevented any significant “southern”moisture from reaching the Mid-Atlantic region or Northeast US. A “clipper” system to our northwest is likely to produce some accumulating snow on Saturday – on the order of a dusting to an inch or two. 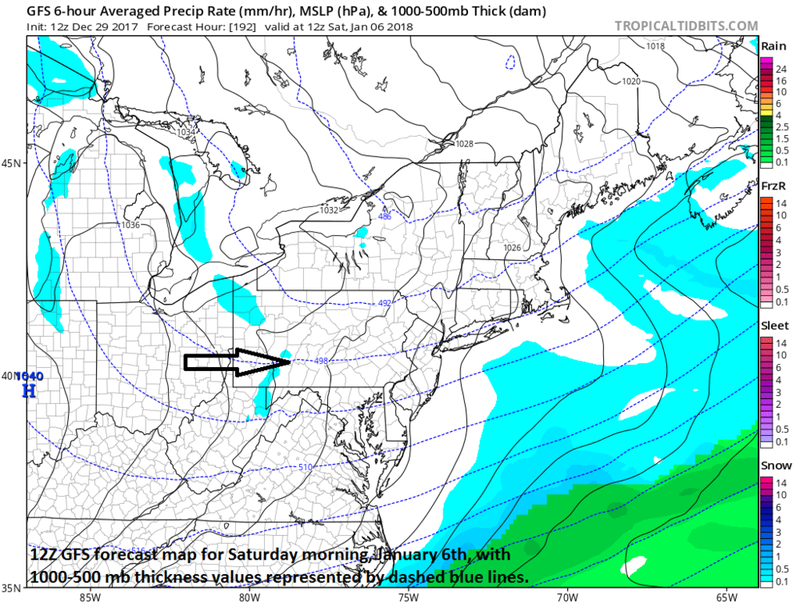 While available moisture for this system is limited, the air will be so cold that snow-to-liquid ratios will be quite high (15 or 20 to 1), and this will allow for accumulation of light, fluffy snow despite the overall very limited “precipitable water” content of the atmosphere on Saturday. One other note, there may be a few snow squalls that form near the Arctic front and any location can pick up a quick inch of snow if impacted by one of these later in the day. Once this “clipper” system passes by, fresh Arctic air will flood into the Mid-Atlantic region on Sunday with stiff NW winds and by early Monday morning, some thermometers may be near the zero degree mark.